With work, parties, Christmas shopping, and a never-ending holiday to-do list, this time of year can send a girl's schedule into overdrive and force her makeup to work overtime. One solution to making sure your skin is as dewy and fresh-looking at 9pm as it was at 9am? 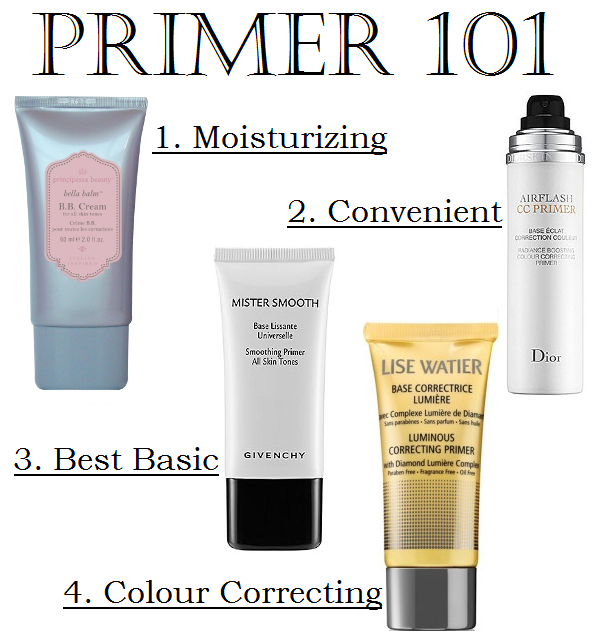 Adding a primer to your beauty routine. Not only do they subtly illuminate skin, correct tone, and blur imperfections, they create a smooth canvas for foundation, powder, and concealer. Here are four I've tried and liked, each for very different reasons. 1. Principessa Beauty Bella Balm BB Cream ($36 at BeautyMark or on principessabeauty.com) bills itself as a universally suitable BB cream, but its sheer colour pigments and non-greasy, silky texture make it an ideal primer. Skip your morning moisturizer and apply this generously before your makeup. Bonus: the natural ginger and white tea fragrance is delightful, and the formula is paraben- and sulfate-free. 2. Dior Airflash CC Primer ($49 at Sephora) is a fast-absorbing, lightweight godsend when getting ready in a hurry. Shake well and spritz in a quick Z zigzag motion 4" away from moisturized skin, or for more control, spritz a face brush and apply. The sheer formula subtly conceals imperfections and imparts a noticeable luminosity instantly. 3. Givenchy Mister Smooth Smoothing Primer ($42 at Sephora) is a best bet for those new to primers. The white formula goes on silky with no chalkiness and is suitable for all skin tones. 4. Lise Watier Luminous Correcting Primer ($39) comes in a rainbow of shades to correct different tone concerns like darkness, sallowness, and redness, or to illuminate. Don't forget to blend well! I'll have to check out the Lise Watier color correcting primer as I have a red undertone and I swear you can still see the redness under my foundation. The green one should do the trick! BB creams are a holy grail beauty product for any girl tight on time. We love trying out new BB creams, and will defintely have to check out this principessa one! It's sheerer than the BB creams I'm used to, which is why it makes a great primer.